sorry can't make something else, so you get crappy wall. I'll give you a bishie next time, I promise! waaaaaa! Thank you, Rissa-chan =D! It's not crappy D:! It's gorgeous x3! I love it! I love the vector <3 and the sky <3 and the colours <3 and everything <3! yay ngambil tema malam hari ! tapi aku pikir sakuranya juga butuh pohon XD munkin tambahin garis2 kaya batang2 warna coklat di bagian yg warna ijo..
plus tambahain cahaya disekitar bulan..
Keren, nih! Cuma extracting, sih, tapi bagus juga, kok. arah cahayanya juga keren, kok. They look so very cute together! Adorable! Awww....bring back all my memories of this show...very cute~ thanks for sharing! WoW! Really beautiful wallpaper. I Love it. 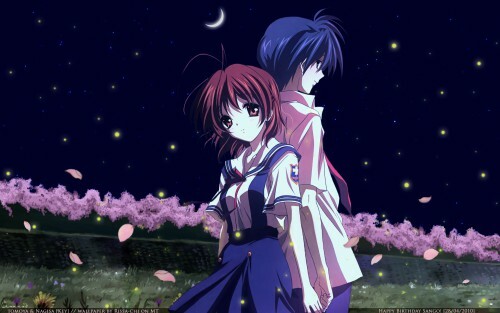 I love this picture of Clannad! wow very cute. I really like how it looks like Tomoyo is supporting Nagisa from the back like he does in the show really good picture and wallie. They'd be together forever it seems. They're so cute!